$USDJPY Grinds Higher: Is this move for real? The $USDJPY has officially wore traders out for the past few months as the breaks were sold into, each and every time. The technical picture has looked good for the bulls for a long time now but every attempt to break and sustain momentum was foiled. Lets get the picture again. My thoughts and work on this pair seem to be on the side of a sustained move above 103. Then it should re-test the high 104 ranges only to break the bears backs towards 107. The chart below shows a long wedged – coiled spring that has seen shallow pullback in the most extreme cases of the USD sell off. The base is rising , the moving averages are rising and the RSI is on a move above the peak RSI from the last attempt at the 100 mark. This should get the attention of some real players on the technical side. That wont be enough to sustain it. The pair needs a good leg up from the Yen smashing that I think is about to happen in the next few weeks. So I expect the dollar to stay firm and the yen to get crushed to peg new lows in the next 6-10 weeks. In the mean time, I trade this long side,core position and leg out at key levels and leg in at key dip support spots. Note: The Bollinger Bands are snapping higher as price breaks above the top BB. FOREX OUTLOOK~THE FED’S TAPERING OF QE– IS THE US ECONOMY READY? As Barack Obama gears up to announce Ben Bernanke’s successor, the Federal Reserve chairman is expected to make the deeply symbolic gesture this week of announcing the beginning of the end of quantitative easing – the drastic depression-busting policy that has led the Fed to pump an extraordinary $85bn (£54bn) a month into financial markets. It will signal the Fed’s belief that the US economy is on the mend, but it could also frighten the markets and hit interest rates. So what exactly is Bernanke doing, why now – and how might it affect the UK and other countries? After on Tuesday and Wednesday’s regular policy meeting, the Fed is widely expected to announce that it will start to “taper” its $85bn-a-month quantitative easing (QE) programme, perhaps cutting its monthly purchases of assets such as government bonds by $10bn or $15bn. It should be: it means the governors of the Fed, led by the chairman, Bernanke, believe the US economy is strong enough to stand on its own, without support from a constant flow of cheap, electronically created money – though they still have no plans to raise base interest rates from the record low of 0.25%, and they expect to stop adding to QE over a period of up to a year. “We really want to see a situation where central banks should not be pumping money into markets. It’s not a healthy thing to be doing,” says Chris Williamson, chief economist at data provider Markit. WHY ARE THEY DOING IT NOW? Economic data is pointing to a modest but steady recovery. House prices have turned, rising by 12% in the year to June. Unemployment has fallen to 7.3%, its lowest level since the end of 2008, albeit partly because many women and retirees have left the workforce. Since QE on such a huge scale carries its own risks – it can distort financial markets, for example – the Fed is keen to withdraw it once it thinks an upturn is well underway. However, some recent data, including worse-than-expected retail sales figures on Friday, have raised doubts about the health of the upturn. There’s another reason too: Bernanke’s term as governor ends in January next year, and he may feel that at least making a start on the process of tapering – marking the beginning of the end of the policy emergency that started more than five years ago – would be a fitting end to his tenure. WHAT WILL INVESTORS BE LOOKING FOR? Long-term interest rates in UK markets have risen sharply since the early summer, at least in part because of the Fed’s announcement on tapering, and that shift, which has a knock-on effect on some mortgage and other loan rates, is likely to continue as the stimulus is progressively withdrawn. HOW WILL THE EUROZONE BE AFFECTED? It could cut both ways: a strengthening US economy is a welcome market for Europe’s exporters, and if the value of the dollar increases against the euro on the prospect of higher interest rates, that will make eurozone goods cheaper. However, the prospect of an end to QE in the US has also caused bond yields in all major markets to rise, pushing up borrowing costs – including for many governments. That could make life harder for countries such as Spain and Italy that are already in a fiscal tight spot. Back in May, Bernanke merely had to moot the idea of ending QE to send emerging markets reeling. A side-effect of the unprecedented flood of cheap money under QE has been that banks and other investors have used the cash to make riskier investments in emerging markets. The prospect of that tap being turned off has already seen capital pouring out of emerging markets and currencies, potentially exposing underlying weaknesses in economies that have been flourishing on a ready supply of cheap credit. “It has triggered all sorts of significant movements around the world out of emerging markets. It’s had big ramifications for India and other parts of Asia,” said Clarke. Central banks in Brazil and India have been forced to take action to shore up their currencies; Turkey and Indonesia also look vulnerable. Many of these markets have looked calmer in recent weeks, but the concrete fact of tapering could set off a fresh panic. I wanted to stress a key point and example of a classic trade I made in the Trading System Model last week and was able to close it out this morning. System Entry long triggers in OPEN at the Pivot point on a day chart at 66.99. Volatility is then measured and the size of the trade is matched next to the risk : reward levels. Risk : Reward is automatically read as a set up with a high probability trade. The PT1 and PT2 levels were set and I double checked the stop loss based on the volatility. Range expansion off the breakout continues for two days as today we see an explosive move. and I hit PT2 at 71.55 today. Think Tank adjusts the last PT2 to included a PT3 above 74 and looking for more gains. I nailed 6 % today alone on PT2. Bottom Line: It’s obviously great to have a trade work as perfectly designed as the $OPEN trade did from entry to exit. The key is risk management and having the structure in place to mange every trade and work the initial strategy to its fullest, or close to fullest, profit targets as your time line is calculated to. As you should know, I hit my PT2 level in STT this morning at 70.50 and made a sale of 1/3 of the position. Normally, I would of sold the balance BUT STT is giving me a new level of profit to gauge in the coming days to weeks. So we will maximize the gains and trail the stop on the last 1/3 of this trade. 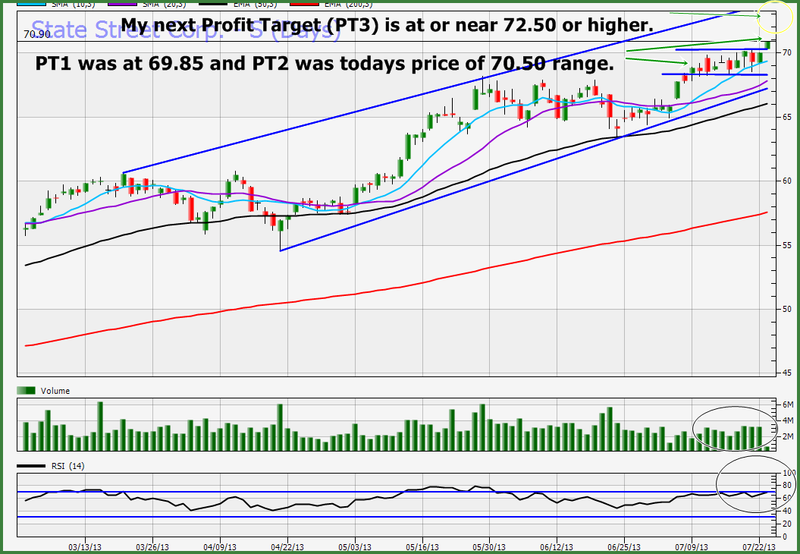 The daily chart of STT shows you why I will look for another leg up to the next PT target (PT3). I will average the PT2 and PT3 sales if I should hit PT3 since my sheets only use twp profit points. See my “Decision Making” tab. STT has based from 68.25 to 70 the past 2 weeks. 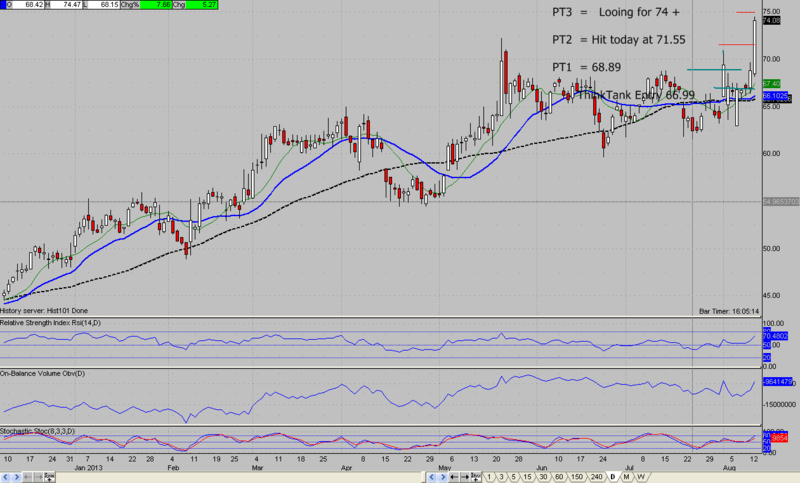 STT broke out from the larger base last month and has held up post EPS. The PT1 and PT2 levels were hit in each case after some rest and then momentum came back into the stock. The $SPX shows no real signs of failing anytime soon. The green arrows are PT1,PT2 and PT3. We hit PT1 and PT2 already. 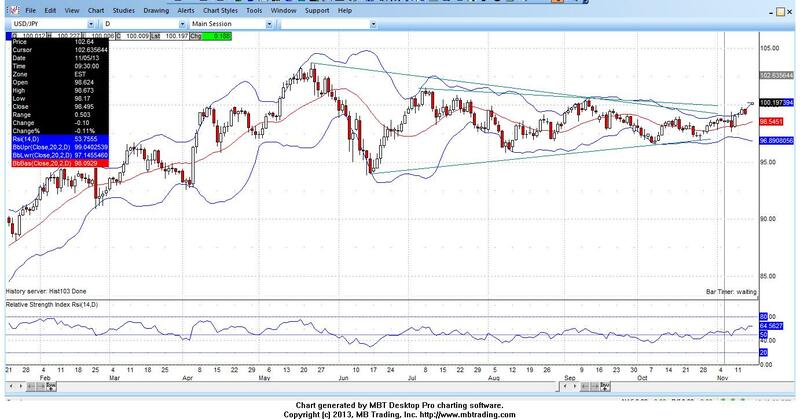 The RSI is showing signs of a pure clean break of the 70 level. Momentum play now ! I will continue to let this stock run its course as we maximize the profits under very low risk since we already booked two good sales. What if the VIX fails to move lower? What if the VIX fails to move lower?.